Goods and services can be paid for in cash or by using non-cash payment options. The Estonian payments market has advanced a long way over the years and electronic methods are mainly used for payments. More than 99% of payments made through banks are initiated through electronic channels and only 1% use non-electronic options like cash payments, paper-based payment orders or cheques. Card payments are where payment is initiated with a payment card from a POS terminal. The card payment is a simple, fast and secure method of payment for both the customer and the merchant. The number of places in Estonia where cards can be used for payment has risen year after year. Payment orders can be given to a bank electronically, on paper or in any other agreed way. The most common form in Estonia is the internet banking payment order, which requires an internet banking agreement. Standing orders are regularly repeated payment orders where the bank makes transfers on behalf of the payer at dates agreed in advance. The payer can set the amount the standing order is for when they sign the agreement. 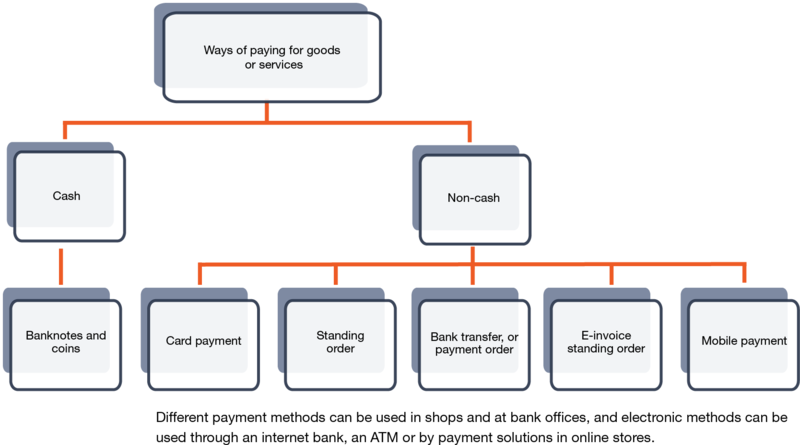 E-invoice standing orders are payments made automatically at a frequency fixed in advance when e-invoices are sent to the bank. Mobile payments are payments for goods or services made with a mobile telephone. E-money is a monetary value stored on an electronic device that may be a plastic card, computer memory or other e-money device. E-money is particularly intended for low-value everyday payments like payments for bus tickets, parking fees or newspapers. Virtual currency is a digital representation of value that is not issued by a central bank, credit institution or e-money institution. In some cases it can be used as an alternative to money. Central banks and supervisory authorities generally find that there are risks to virtual currency.